We must have heard that the most important ingredient required for winning is the attitude. Attitudes, behaviors and character are created by various sources. All aspects of our life are governed by the attitudes we have towards our environment. If we tend to have a negative attitude, the blessings in life eventually fade away. Money is a very important part of our surroundings and our negative attitudes as fear, detachment, or thinking it of evil all gradually lead to money vanishing from our lives. I would today like to outline the bad attitudes and negative behavior towards money and identify and learn how they are seeded in my personality. Attitudes and behaviors are cultivated through various inputs from our surroundings. Here, I would pick “CULTURE” and highlight how negative attitudes and behaviors are created by cultures. Cultural background is imparted from one generation mostly through the means of storytelling. 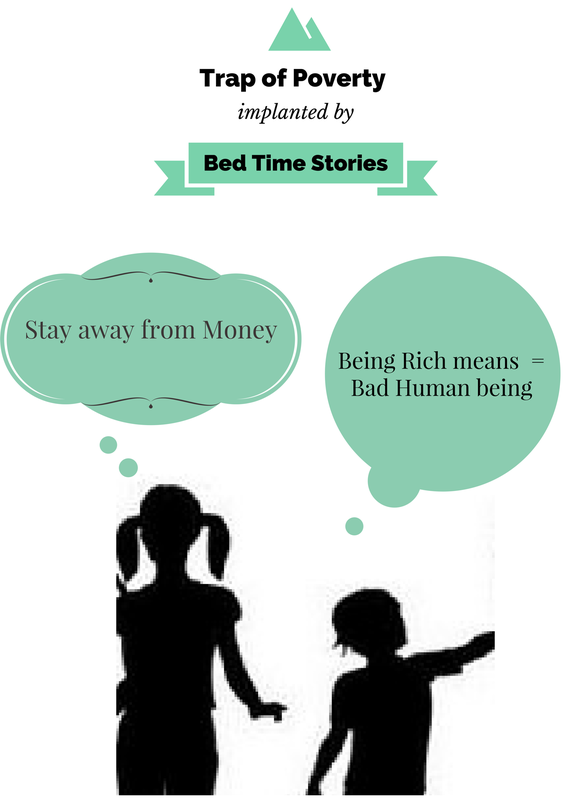 Bed time stories and moral stories learnt at school, are a rich source of culture. Let’s take a look 3 stories we tell our children relating to money and the underlying beliefs these stories form in relations to money and values created. This story starts with a background explaining, a poor honest woodcutter ( note: honestly and poverty are linked) looses his only, iron axe in the river mistakenly and refuses to accept the golden axe, the sliver axe and accepts his the iron axe. This story, sadly underlines honesty leading to a lifestyle, where he continue to be poor. This story lacks the imagination how a poor person was an opportunist, who availed a golden opportunity or a silver opportunity for a good life keeping in tact his honestly. Whereas the woodcutter chooses, to turn down the golden and silver chances and decides to live in his miser comfort zone. These are character barriers which the above story narrates and implants blind and pessimist character in the audience towards golden opportunities in life. 2. A greedy merchant gets rid of his bloom of turning everything he touched turn into gold. The background of this story narrates, a rich miser and selfish merchant ( linking “riches” with negative character being “selfish”) pleases the Goddess of wealth and receives a boom of turning any object he touch, should turn into gold. On being blessed, by such a boom he becomes over joyed initially but his blessings soon turns into a curse when he is unable to eat or drink anything because his food turns into gold as soon as he touches it, and he starves, he also mistakenly touches his daughter who turns into gold. And finally he regrets and concluded that money is no good in life and gets rid of his boom. Again, this story is weak, and has a negatively impacting attitude towards money and riches. The story portrays an imagination that being financially strong translates to bad health and disputed family life. Also creates a mental barrier that those who work hard with dedication and become capable to turn all that they touch into gold will lead to unhappiness in all aspects of life. This story lacks how the merchant coped with his boom to achieve greater prosperity for self and society, keeping up his health and family happy. Here there is more a mental destruction, than enhancement. I would like to narrate a story that contrasts with the above negative beliefs. 3. Story of wit and cleverness of Tenali Raman. Tenali is described as a very clever and learned person. At the beginning of his successful career he was guided by his Guru ( mentor), to worship the Goddess of wealth to give him directions. He followed the advice and undertook a very diligent worship and was successful in pleasing the Goddess. She appeared and brought along 2 bowls to choose from. One a golden bowl containing milk, which will bless him with riches but he will not have any intellect. On the other hand the sliver bowl containing curd, which will bless him in being a learned person but being poor all his life. Along, with a condition to, choose and eat the contents of only one bowl. And since Tenali Raman was a clever person he mixes the contents of sliver bowl into the golden bowl and eats from the golden bowl. Ensuring he is blessed with riches and intellect both. And thereby fulfills the condition of eating from only one bowl. This story is a true example of using cleverness to have a financial abundant life along with great intelligence.